In March 2011, a daring ADI investigation exposed the sickening abuse of Anne the elephant and other animals at Bobby Roberts’ Super Circus winter quarters in the UK. The horrific images that ADI caught on film of Anne, chained and being beaten sent shock waves around the world. Within two weeks Anne was removed from the circus. A month later the circus gave up Monty the camel. Due to the public interest in the case, the Crown Prosecution Service agreed to take on the prosecution of Bobby and Moira Roberts and on 23 November 2012, Bobby Roberts was found guilty of mistreatment to Anne the elephant. To find out more about the case see our ‘Latest news’ section below. Anne’s terrible ordeal would be continuing now if it had not been for ADI investigators. 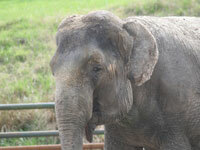 Help us expose suffering and save more animals like Anne who’s suffering otherwise goes unseen. Donate toward our investigations now. At today’s pre-trial hearing at Corby Magistrates Court, Northants, the legal team of circus owners Bobby and Moira Roberts was criticised by the Magistrate after again failing to submit all their defence statements. A third pre-trail hearing has now been set. Thursday 16 February, 10am: This Thursday morning at a pre-trial hearing at Corby Magistrates Court, Bobby and Moira Roberts will lay out their defence on charges that they failed in their duty of care to protect Anne. Duty of care and responsibility of owners to be tested in landmark case as Bobby and Moira Roberts plead “not guilty". In a landmark case, the trial of Bobby and Moira Roberts will begin on the 1st December at Corby Magistrates Court for offences under the Animal Welfare Act 2006. From Jan Creamer, ADI Chief Executive. Sir Paul McCartney pledges support for ADI’s campaign along with cross-party MPs. The Crown Prosecution Service has agreed to take on the prosecution of Anne’s previous owners Bobby and Moira Roberts.